In Jurassic World we see the vision of Jurassic Park realised: a fully functioning theme park and resort island where twenty thousand visitors a day come to see genetically engineered living dinosaurs. It is SeaWorld on steroids. But the park has been open for a while now, and numbers are starting to plateau. As operations manager Claire Dearing (Bryce Dallas Howard) explains. “People aren’t wowed by dinosaurs anymore. Twenty years ago, de-extinction was up there with magic. Now kids look at a stegosaurus like it’s an elephant at the zoo.” So in order to keep the crowds coming, Jurassic World’s team of scientists have moved into a new frontier of genetic innovation. They have started inventing new dinosaurs. Their crowning achievement is Indominus Rex, a giant, super intelligent and adaptable apex predator designed to dwarf the T-Rex. Of course it is only a matter of time before this monster which they don’t fully understand breaks out of its enclosure and roams free on an island with 20,000 tourists. Our specific concern is with Zach (Nick Robinson) and Gray (Ty Simpkins), Claire’s nephews who have come to visit her but due to her busyness are wandering unaccompanied through the park. So Claire needs to team up with raptor trainer and ex-marine Owen Grady (Chris Pratt) and head out to save them. So it is two decades after the first disaster at Jurassic Park and it turns out that a theme park with real dinosaurs is still not a good idea. But this is kind of the point of the movie. In addition to the standard cautionary tale about hubris and the dangers of playing god, Jurassic World is a film about corporate greed, about the idea that people will continue to make the same mistakes again and again as long as there is money on the table. 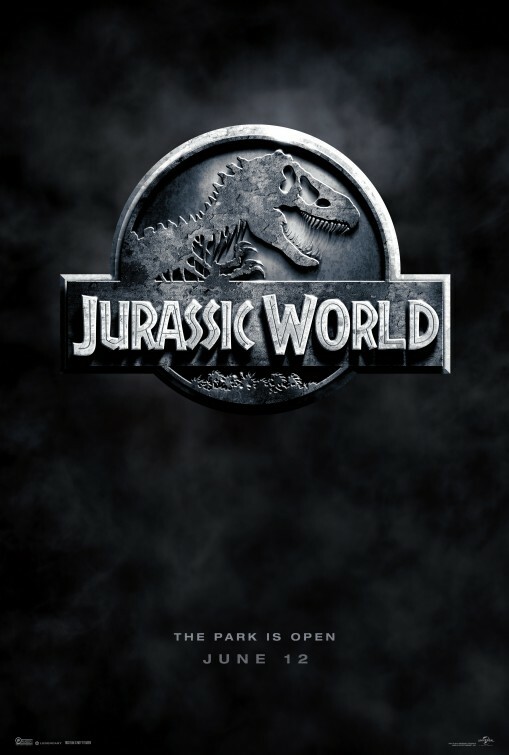 It is quite a self-reflexive theme for what is Universal’s third underwhelming attempt at a sequel to the original Jurassic Park (though with the film having taken a record US$524.4m internationally on its opening weekend, you can see exactly why Universal went back). Director and co-writer Colin Trevorrow (making a considerable step up from his indie debut feature Safety Not Guaranteed) embraces this self-reflexive and at times self-deprecating tone. At one point Claire chastises an employee for wearing a t-shirt with the classic Jurassic Park logo on it, saying it is in poor taste. That employee later pokes fun at the extent of product placement within the park, all while the film indulges in heavy product placement of its own. Even the narrative itself of working out how to bring people in the gates when they are no longer wowed simply by seeing a living, breathing dinosaur is a nod to Jurassic World’s own conundrum. In 1975, Steven Spielberg invented the summer blockbuster as we know it with Jaws, in which he made us afraid to go in the water by showing as little of the shark as possible. In the original Jurassic Park, audiences were awestruck by the film’s dinosaurs, yet the film only featured fourteen minutes of dinosaur effects in its 127 minute runtime. There doesn’t seem to be room for that kind of restraint in blockbuster filmmaking anymore. A mere glimpse of a creature is no longer enough to blow an audience away, so in Jurassic World the dinosaurs are numerous and constant. The aim is to be the Aliens to Jurassic Park’s Alien: more of everything and less subtlety. But where the original was ground breaking in its effects, here the spectacle is no grander than the dozen other digital effects-heavy blockbusters that will come out this year. It is telling that the most exhilarating parts of the film, the bits that will really give you goose bumps, are those moments when we hear John Williams’ old score. Unsurprisingly, character development is not the highest of priorities. Chris Pratt is Hollywood’s man of the hour. He is cool, handsome, charismatic and funny. But his character here, through no fault of the actor, falls flat. Owen Grady is supposed to be the cool character but he is not fully fleshed out and thus he misses the mark. Rather than a real person he feels like a cobbled together image of what cool and charismatic is supposed to be. Bryce Dallas Howard’s Claire Dearing is equally thinly drawn as the highly-strung careerist who, when the time comes for action, ties a knot in her blouse but keeps her heels on. Jurassic World is classic popcorn movie making. It is a roller-coaster and it is effective to a certain extent. But the spectacle lacks substance, and the sense of wonder and awe that made Jurassic Park so effective is nowhere to be found. Have you seen Jurassic World? Leave a review and let us know what you thought. If there is a monster in a cage, you can be certain it will get out of the cage before the film is over. Personally, I liked Claire’s characterization. She has a character arc and grows and changes, resetting her priorities in life.